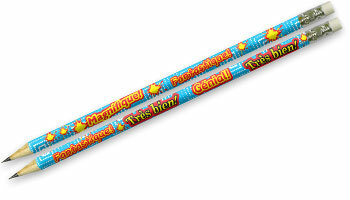 Reward your pupils with these fabulous French reward pencils! Each features various messages of praise in French; Fantastique! Magnifique! Très Bien! and Génial! Ultimate pencil for best students. I use these as the "student of the month" award. Lovely pencil. These pencils are good value for money and are nice to give as a reward or gift to children learning French. I thought these pencils were excellent value. Perfect for prizes. Nice design too! I gave these pencils to Year 6 children at the end of the summer term as a leaving present. They loved them. They also arrived very quickly. Fantastic pencils. The children were so pleased to receive them and they arrived so quickly. Another super product from this company.